Spacious Accomodation 1706 sq. ft.
Robinson Marsh is pleased to offer a fantastic four-bedroom House that is ideal for a couple and as a family home. This house offers spacious living accommodation 1706 sq. ft. spread across three floors and situated on a prominent in Romford. 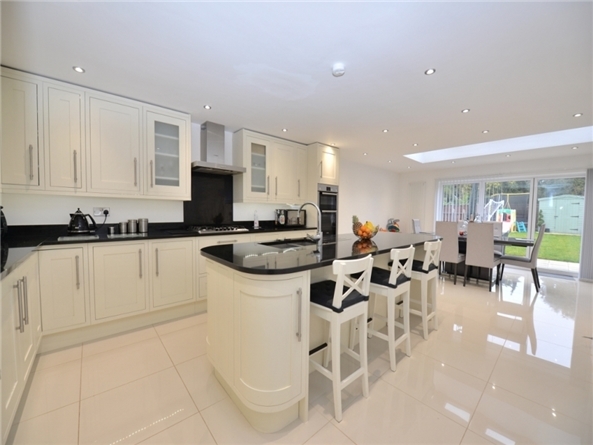 The ground floor comprises of; entrance hall, a stunning kitchen/diner encompassing a fully fitted kitchen with integrated Bosch appliances and black granite worktops. You access the well-maintained rear garden through mpressive Bi-folding Doors. A separate utility room that has matching units and granite worktops integrated washer dryer, an additional sink, and Boiler. Good size living room is located at the front of the property benefiting from solid oak hardwood flooring. Also benefits from downstairs WC and Cloakroom. The first floor offers a three bright and spacious bedrooms and a good size family bathroom. The second floor boasts a stunning master bedroom suite offering good-sized room with a contemporary en suite bathroom. There off-street parking for two vehicles. The property is located a short walk from Romford Town Centre and Romford Station benefiting from future Crossrail connections into London. Thereare many local amenities on the doors step such as supermarkets, shopping centres, markets, cafes, and restaurants.